Rihanna's used to taking big fashion risks that pay off (ahem, every Met Gala ever), and the Ocean's 8 premiere was no exception. The 30-year-old singer, entrepreneur, and now actress stepped onto the red carpet on June 5 in a ruffled one-shoulder Givenchy dress that cascaded down one side, giving a beautiful waterfall effect. She paired her unique gown with delicate strappy purple heels, a BVLGARI watch and earrings, and a matching jeweled clutch. 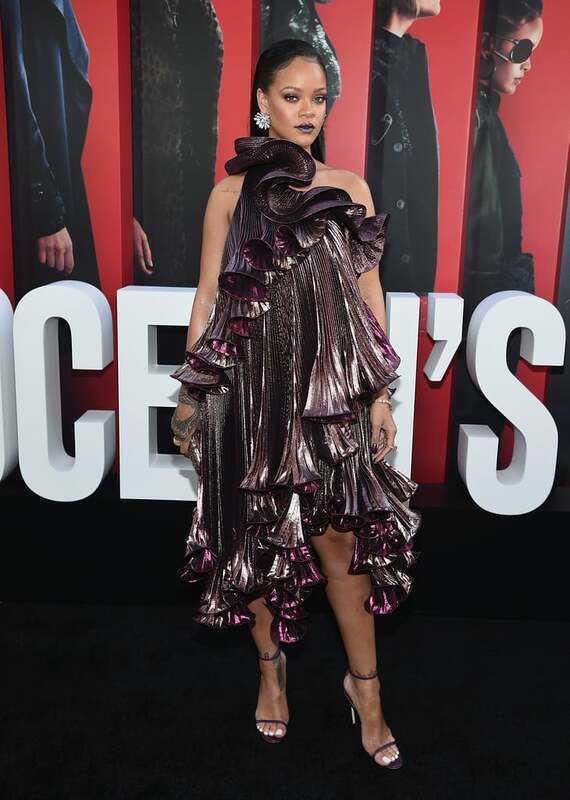 Rihanna is radiant no matter what she wears, but the metallic tint of her dress caused her to shine so brightly at the premiere, she had to catch everyone's eye.